The best Litebans Web GUI you can use with over 8 new features. Diclo, Cli3nt_, SuisDorn and 7 others like this. The developer is very friendly, providing amazing support for anyone who needs it, which for a free resource is amazing. 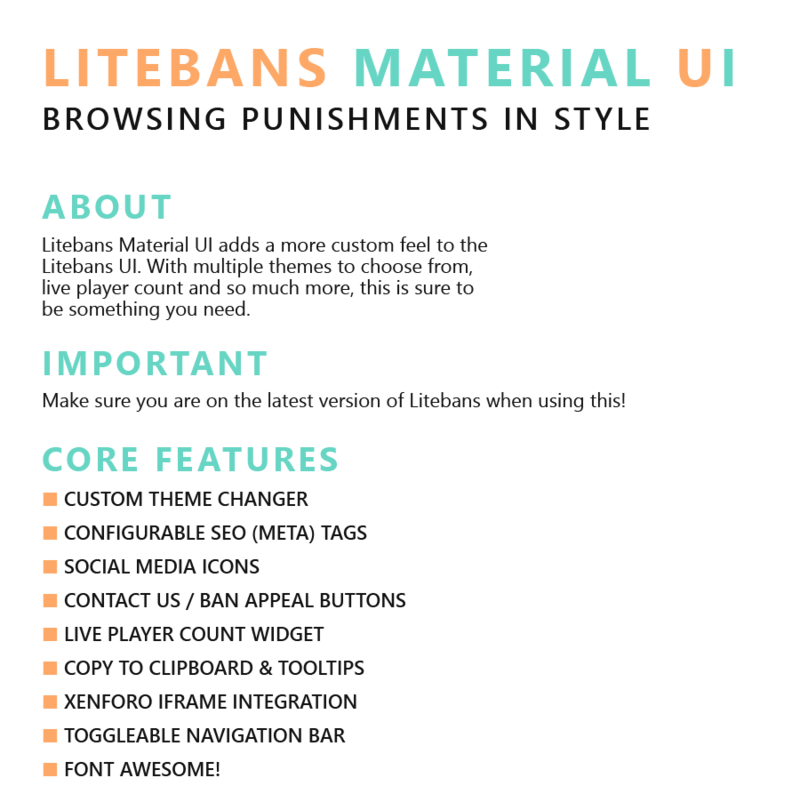 The resource itself follows Google's Material standards very well, and is (in my personal opinion) the best LiteBans skin out there. It comes with multiple themes, and if you have a basic knowledge of PHP/HTML you can create your own modern theme for your new server. Really good work from a skilled developer, and I'm happy to use it with my own server. Awesome. Works for the best & also is easy to set up. Very good!!!!! I like this!!!!!!!!!!! Really great substitute for the bland default litebans theme. Developer helped me with a couple issues I had within minutes after installing the software. Only issue I have is the backgrounds aren't really high-res, however that can be fixed by replacing them with your own background images. Love the designs. Very clean, and easy to use. Glare is a great developer & very helpful too. Keep up the good work. This is great, makes my bans page look fantastic when before it looked like crap. Keep up the good work, look forward to your updates! Never an issue - The updates are always warranted, good changes for the better. Installation is easy and support is always withing a reasonable time. Glad for the discord and the discussion area for when support is needed. Great work. This is great! Just what I was looking for. Look forward to future updates on this resource! Allow users to buy commands! Setting custom cooldowns and requirements on warps has never been easier! Checking a player's play time has never been easier. 1.13 Supported!